WARREN GATLAND HAS changed the mentality within Welsh rugby so they now go into tournaments as favourites instead of underdogs, says former Wales skipper Sam Warburton. Gatland has won three Six Nations titles, two Grand Slams and reached the semi-finals of the 2011 World Cup since taking charge in 2007. They stand on the verge of another Six Nations Grand Slam this weekend, Gatland’s side needing to beat Ireland in Cardiff to complete the job. 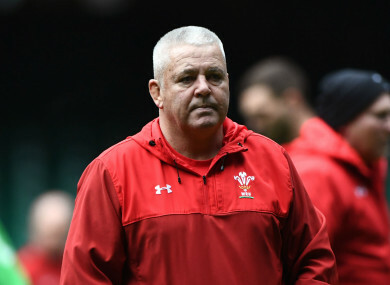 And Wales’ transformation into a dominant force is all down to the impact of Gatland – who will leave his role after this year’s World Cup in Japan – according to Warburton. “He has changed the perception of the Welsh public from being underdogs, which they were used to in the 1990s and 2000s,” said Warburton. “It is normal now to expect to win a Six Nations campaign year in, year out. He has changed the psychology of the Welsh team and public. That underdog status has pretty much gone now. You do not want to be the underdog. Warburton is confident Gatland can finish on a high in Japan later this year. “I still think he has more to do,” added the former Wales captain. “He knows that. I still think we will see him achieving big things after this World Cup. Email “Warburton hails 'brilliant' Gatland for transforming Welsh rugby”. Feedback on “Warburton hails 'brilliant' Gatland for transforming Welsh rugby”.